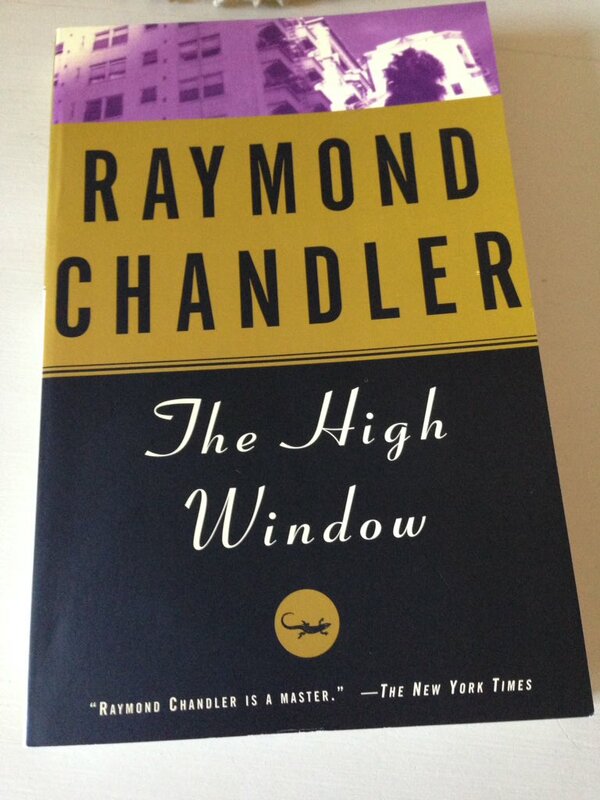 Something slightly different from me today, a little look at one of Raymond Chandler’s novels, The High Window (1942), his third featuring the legendary private eye, Philip Marlowe. As I’ve written about Chandler before – there are links to my previous posts here: Farewell, My Lovely and The Long Good-bye – I’ll try to keep this review fairly brief, certainly as far as the plot is concerned. The novel opens in traditional hard-boiled fashion with Marlowe visiting a new client at her home, an elaborate but soulless mansion in Pasadena, Los Angeles County. The woman in question is Mrs Elizabeth Bright Murdock, a wealthy, cantankerous old widow whose main pleasures in life appear to involve the consumption of large quantities of port and the systematic bullying of her repressed secretary, a rather neurotic young lady by the name of Merle Davis. Mrs Murdock is in need of ‘a nice clean private detective,’ someone to investigate the theft of a rare gold coin, the Brasher Doubloon, the pride of her late husband’s private collection, normally kept under lock and key in a secure room in the house. As far as Mrs Murdock is concerned, the coin has been taken by her wayward daughter-in-law, the former nightclub singer, Linda Murdock (nee Conquest), a woman she has never liked – both the coin and the girl disappeared at the same time, hence the suspicion surrounding her involvement in the case. I love this first passage – it’s taken from a scene where Marlowe is sizing up Linda Conquest, just from a photograph given to him by Mrs Murdock. It’s textbook Chandler. She turned the colour of a cold boiled beet and opened her mouth to yell. Then she thought better of it, lifted her port glass and tucked away some more of her medicine. Somewhat reluctantly, Marlowe takes the case – after all, there are bills to be paid and bottles of liquor to be purchased. So, he sets off to find Linda’s former flatmate from before her marriage, a nightclub entertainer named Lois Magic. As is often the case in these stories, the opening premise is simply the first thread in a complex web of deep-rooted corruption, an entanglement of messy crimes and grubby misdemeanours. The underlying situation is much more involved and intricate than it appears at first sight. Turns out that Leslie Murdock is in hock to Alex Morny – the nightclub manager and husband of Lois Magic – to the tune of $12,000. And that’s merely the start of it; there are many more twists and developments to come. Marlowe’s quest for the coin takes him into seedy offices and apartments, glamorous nightclubs and bars, a veritable myriad of sleazy locations in the city. Along the way, he discovers evidence of murder, infidelity, blackmail, counterfeiting and sexual harassment, some of which have been kept under wraps for several years. Perhaps unsurprisingly, there comes a time when Marlowe finds himself caught between the police and his client in the quest for some kind of moral justice. While never losing sight of the need to stay on the right side of the law to maintain his status as a private eye, he is also aware that there is the confidentiality of his client to protect. Either way, our protagonist is trapped between a rock and a hard place, grappling with a situation he can barely begin to understand. Once again, I am struck by just how many of these hard-boiled stories coalesce around dysfunctional families, often headed up by a poisonous matriarch as is the case here. Mrs Murdock is a prime example, a cold, bitter, unscrupulous woman who will stop at nothing to protect her own position. She really is quite a character. While The High Window isn’t quite up there with the best of Chandler’s novels (for me, that would be The Big Sleep or The Long Good-bye), it still makes for a terrific read. Once again, I find myself admiring this author more for his writing than his plotlines. It’s all about the exhilarating prose style, peppered as it is with sharp dialogue and quotable one-liners. Here’s one of my favourites from the book, a wonderful description of the Idle Valley Club, the joint where Linda and Lois used to work. Then there’s the irresistible combination of atmosphere, mood and indisputable sense of place. No one writes about Los Angeles quite like Chandler, from the plush estates of Bel Air to the rundown areas like Bunker Hill. I’ll wrap things up with a final quote, one that captures something of the dark underbelly of the city. The High Window is published by Vintage Crime/Black Lizard; personal copy. This entry was posted in Book Reviews, Chandler Raymond and tagged Book Review, Classics Club, Crime, Raymond Chandler, US, Vintage Crime / Black Lizard on September 12, 2017 by JacquiWine. 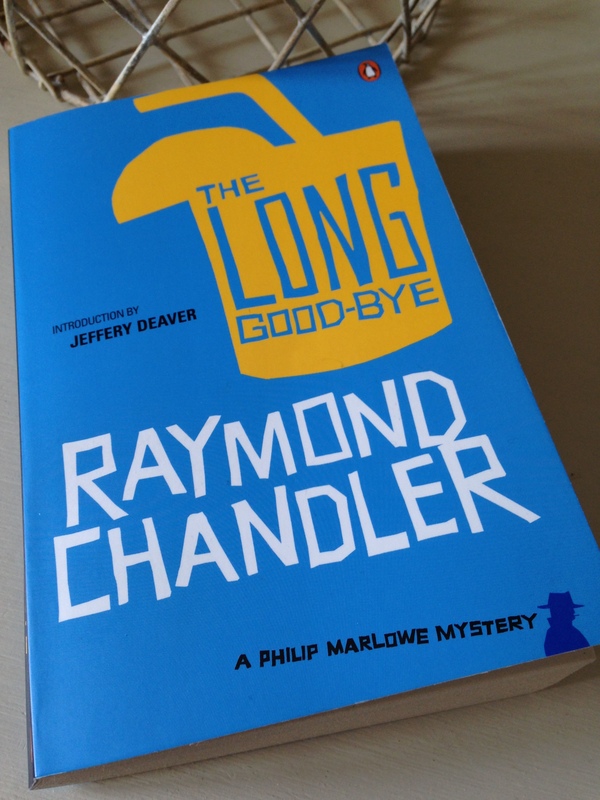 First published in 1953, The Long Good-bye is the sixth novel in Chandler’s Philip Marlowe series. I read most of them when I was a teenager, so they’re rereads now (my review of Farewell, My Lovely is here). I’d always considered The Big Sleep my favourite Chandler – after all, it was my first encounter with Marlowe and the hard-boiled crime novel in general. The Long Good-bye , however, is giving Sleep a serious run for its money, certainly on the evidence of this reread. As the novel opens, Marlowe stumbles upon and befriends a drunk by the name of Terry Lennox. Lennox has been abandoned by his ex-wife, Sylvia, who dumps him in the parking lot of a club. Over the course of the next few months, Marlowe runs into Lennox again, and the two men share the occasional drink together – gimlets at Victor’s bar. Lennox has remarried Sylvia, but their relationship remains rocky to say the least. Late one night, Lennox turns up at Marlowe’s home and asks if his friend will drive him to Tijuana where he plans to hop on a plane to Mexico. Marlowe agrees even though he suspects Lennox is fleeing the country because the cops are after him. Marlowe doesn’t want any details – he can tell it’s something serious, that’s enough. On his return from Tijuana, Marlowe receives a visit from the cops who haul him in for questioning on suspicion of accessory after the fact. Sylvia has been found dead, apparently beaten to death with a bronze statue, and Lennox is the prime suspect. When Lennox’s body is found in Mexico along with a suicide note and confession to Sylvia’s murder, Marlowe is released without charge. But Marlowe doesn’t buy the confession – Lennox didn’t seem the type to murder his wife, certainly not in such a brutal manner. Marlowe continues to harbour suspicions about the case, a situation only exacerbated when he receives a warning from Harlan Potter’s lawyer, Sewell Endicott. Potter, a powerful media mogul and father to Sylvia Lennox, wants Marlowe to keep away from the case. Why stir up any unpleasant publicity now that the murderer has taken his own life? The novel contains a second plot strand, one involving an alcoholic writer, Roger Wade, and his wife, Eileen. Marlowe is approached by Wade’s publisher, Howard Spencer, who asks him if he will keep an eye on Wade until he finishes writing his latest novel. Wade has a habit of getting drunk and disappearing for a few days here and there. Marlowe doesn’t want to take the job but gets involved when Eileen Wade appeals to him personally. It was two o’clock when I got back and they were waiting for me in a dark sedan with no police tags, no red light, only the double antenna, and not only police cars have those. I was half-way up the steps before they came out of it and yelled at me, the usual couple in the usual suits, with the usual stony leisure of movement, as if the world was waiting hushed and silent for them to tell it what to do. At first, the two plot strands seem separate from one another, but as the story develops it becomes clear that they are connected. Good-bye contains a plenty of twists and turns, but the storyline feels very satisfying. The Long Good-bye, is reported to be Chandler’s most personal book. I can’t comment on that, but it certainly feels like his most ambitious work. This is a first-class hardboiled novel, but there’s more to it than that. Chandler uses The Long Good-bye as a means of raising questions about the society of the time – the rich and powerful are his key targets. This novel, like the others, is set in Los Angeles. At times it feels like a lament for the loss of decency and justice in the city (if these things ever existed in the first place). Towards the end of the story we can sense that Marlowe is growing more than a little tired of this town. Twenty-four hours a day somebody is running, somebody else is trying to catch him. Out there in the night of a thousand crimes people were dying, being maimed, cut by flying glass, crushed against steering wheels or under heavy car tyres. People were being beaten, robbed, strangled, raped and murdered. People were hungry, sick, bored, desperate with loneliness or remorse or fear, angry, cruel, feverish, shaken by sobs. A city no worse than others, a city rich and vigorous and full of pride, a city lost and beaten and full of emptiness. It all depends on where you sit and what your own private score is. I didn’t have one. I didn’t care. Jose at The Game’s Afoot has reviewed this novel. I haven’t reviewed The Big Sleep, but there’s a great selection of quotes from the novel in this post by Tomcat in the red room. The Long Good-bye is published by Penguin Books. Source: personal copy. Book 16/20 in my #TBR20. 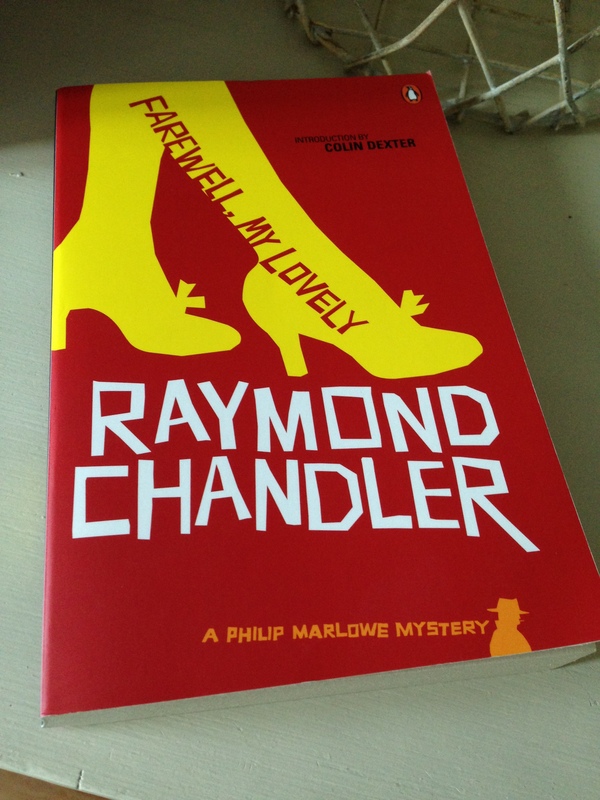 This entry was posted in Book Reviews, Chandler Raymond and tagged #TBR20, Book Review, Crime, Fiction, Penguin Books, Raymond Chandler, US on April 22, 2015 by JacquiWine. In Farewell, My Lovely, Chandler’s second novel, the action opens with Marlowe investigating a run-of-the-mill missing-person’s case. During his pursuit, Marlowe stumbles upon something far more interesting altogether. He encounters Moose Molloy, a big bruiser just out of jail and on the lookout for his former love, Velma. The scene is Florian’s, a ‘dine and dice emporium’, a place where Velma worked as a singer at the time of Moose’s conviction some eight years ago. Before he knows it, Marlowe is right in the thick of it; Moose, who doesn’t seem to know his own strength, ends up breaking the bar manager’s neck and heads off with a gun leaving Marlowe to get drawn into the investigation. A man named Nulty got the case, a lean-jawed sourpuss with long yellow hands which he kept folded over his kneecaps most of the time he talked to me. He was a detective-lieutenant attached to the 77th Street Division and we talked in a bare room with two small desks against opposite walls and room to move between them, if two people didn’t try it at once. Dirty brown linoleum covered the floor and the smell of old cigar butts hung in the air. Nulty’s shirt was frayed and his coat sleeves had been turned in at the cuffs. He looked poor enough to be honest, but he didn’t look like a man who could deal with Moose Molloy. ‘Well, what do I do – date her up?’ Nulty asked. ‘Skip the wisecracks,’ Nulty said. Alongside the search for Moose and Velma, Chandler introduces another stand to narrative as Marlowe picks up a job accompanying a man aiming to buy back a stolen necklace. At first the two cases appear unconnected, but Marlowe sniffs out a link, and our down-at-heel detective gets sucked into a web of corruption and power that has infected the affluent classes. Marlowe works on hunches, gets into all manner of scrapes, but we seem to know he’ll make it through somehow. Farewell, My Lovely is a great noir – perhaps not quite up there with The Big Sleep, but it’s a downright enjoyable read all the same. Highly recommended. Farewell, My Lovely is published in the UK by Penguin Books. Source: personal copy. This entry was posted in Book Reviews, Chandler Raymond and tagged Book Review, Crime, Fiction, Raymond Chandler, US on September 15, 2014 by JacquiWine.